3 Bedroom Terraced House For Sale in Banbury for Guide Price £350,000. 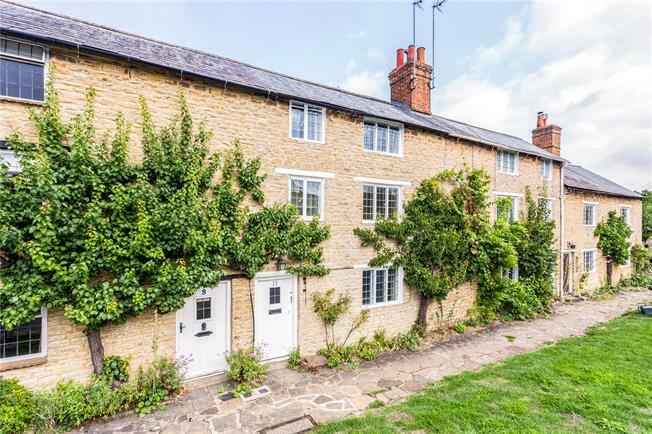 An attractive Grade II Listed period cottage offering characterful accommodation including an entrance hall with doors leading to the sitting room and dining area. The sitting room has an impressive fireplace with bread oven and canopy, ceiling beams and a feature internal window. The dining area has a deep shelved pantry, staircase rising to the first floor, ceiling beams and a step up into the kitchen. The kitchen offers a range of pan drawers and base units with oak worktops, gas double oven and gas hob, integrated fridge and dishwasher. A door leads from the kitchen to the garden and outbuilding. On the first floor there is a landing with exposed elm floor boards, ceiling beams and a staircase to the second floor. There are two bedrooms on this floor, one with a fireplace set within the exposed brick and stone gable wall, both with exposed floor boards and ceiling beams plus a family bathroom including a free standing roll top bath with ball and claw feet, pedestal wash basin and low-level WC. On the second floor there is a study/work area, good size bedroom with fitted wardrobes and shower room all with exposed beams, timbers and floor boards. Off the kitchen, stone steps lead to a private terrace which is enclosed by dry stone walling and the outbuilding. The garden is filled with shrubs and bushes, well stocked borders and a wildlife pond towards the far end. The majority of the garden is laid to lawn and extends to approx 54ft in length. The garden is surrounded by attractive stone walling plus there is a stone outbuilding with services, currently housing the freezer, washing machine and water meter. There is also an attached stone garden store. The property has the distinct advantage of owning a brick built garage situated directly opposite, across the village road. It has light and power and a space in front to park a second car. The garage is leasehold with 999 year lease dating from 1964. Maintenance cost £62 PA.
Night Storage Heater in the Kitchen.